The obsessive coverage on Sky News surrounding the birth of the future British king highlighted everything that is sour in the celebrity-driven media. Ever since the Duchess of Cambridge went into labor, Sky News ramped up its already intense coverage of the royal birth to levels rarely witnessed. 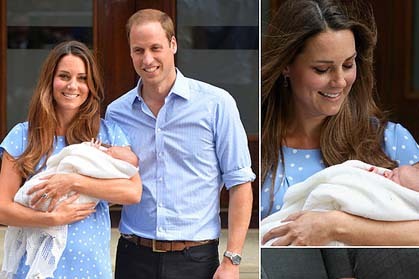 Presenters and reporters stood in the baking heat outside St Mary's Hospital in Paddington and struggled to fill hours upon hours of broadcast time as they desperately waited for the pitter-patter of tiny royal feet. During ‘silly season’ news is hard to come by so stories can often be stretched out of proportion to fill airtime and column inches. But why was Sky News, more than any other broadcaster, seemingly so obsessed with the royal baby? Their agenda, which truly began with Lady Diana, is focused on maintaining the celebrity status of certain members of the Royal Family. This not only helps fill endless hours of ‘royal’ coverage but feeds into the group’s other media outlets in print and online. It also neatly follows Sky News’ Conservative and royalist agenda. So, presenters such as Kay Burley, will stand for days outside a hospital with little ‘newsworthy’ to talk about knowing full well in the long run they are helping give birth to a celebrity that will spawn many scoops and sensational stories in the future. Irish people are avid consumers of media, but how many are truly aware of how much this media environment is manipulated everyday. This results in crucial discourse, such as the abortion debate, being influenced by those on both sides less interested in truth and facts than they are about swaying public opinion. The media if often thought of as the Third Estate, separate from the government and the judicial system, helping to make society more transparent and accountable. However, even television channels, newspapers and radio stations dictate the news we get to watch, read and listen to; and let’s face it the best spin-doctors are the media themselves. They shape the agenda according to their own particular bias. And in an era of the ‘viewspaper’ where opinion is king, hidden ‘agendas’ can be far more influential. Transparency in today’s media environment is nothing but a pipe dream, so it is up to us as consumers to be more shrewd, circumspect and cynical when it comes to digesting the news. And while we all should welcome the birth of the royal baby, we should be aware that for the likes of Sky News, this is just a celebrity building exercise that will spawn stories during silly season for decades to comes. Paul Allen is Managing Director of Paul Allen and Associates PR, www.prireland.com.